Club Penguin Cheats by Mimo777 Club Penguin Cheats by Mimo777: Club Penguin Toys in Mexico Soon! You asked, and the team was working hard to make it happen: Club Penguin toys will hit stores in Mexico soon! 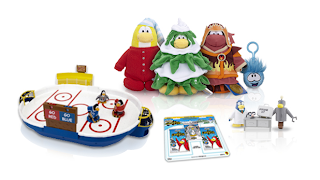 Puffle plush 4", penguin 6.5", keychain puffles, Mix N 'Match 2" figures and hockey game. Trading Card Card-Jitsu - Series 1. Bookseller: sticker albums and Card-jitsu erasers. And you, what excites you most of all this? Tell us in comments! Cool! So glad for the Club Penguin fans of Mexico! Do you have Club Penguin toys where you live? If not, do you wish you did? Rockhopper disappeared from sight at telescope! My puffles are missing again!!! i live in Wagga which you wouldn't know of, but we have a limtited range of toys (card jitsu cards, keyrings, plush toys and plush puffles) They hav sold them since treasure book 3, so i have a lot of stuff from that book. Series 1 cards???!!! But we are on series 4.2! Off topic, but MY PUFFLES ARE GONE! Again, Club Penguin?! Liverpool is a store AND a city! LOL!